Samsung Group, the country's top conglomerate, still has time to improve its ownership structure, and it's the matter of whether the group's de facto leader Lee Jae-yong will do it or not, the head of the nation's corporate watchdog has said. Last week, the Fair Trade Commission proposed a revision to the antitrust law under which a new holding company is required to own more than 30 percent of a listed affiliate and more than 50 percent of an unlisted affiliate, 10 percentage points higher than the currently required threshold. The proposal has spawned speculation that the revision was designed to prod Samsung to speed up its move toward building up a improved ownership structure. But FTC Chairman Kim Sang-jo said Samsung still has leeway as the proposed revision will take effect after getting approval from parliament after a one-year grace period. "The law does not go into effect immediately after the passage," Kim said in an interview with Yonhap News Agency on Friday. He also pointed out that revised tax codes also allow an additional three-year grace period for deferred taxation for a new holding company. "For example, I can say in three years, if Samsung is not able to (transform into a holding company structure) or does not do so during the period, it won't be able to transform itself ever again," Kim said. "In a nutshell, the issue is up to Samsung Electronics Vice Chairman Lee's decision." 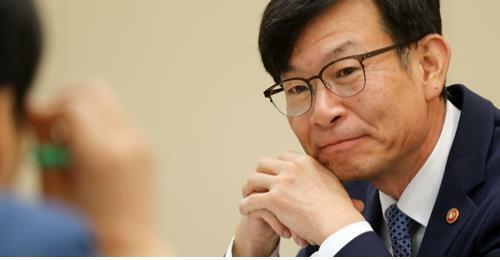 The FTC chief, a renowned civic activist for his minority shareholder movement and dubbed "a sniper" of chaebol, was tapped to lead the corporate watchdog last year, in a show that the incumbent government is serious about changing big businesses here. Kim has said earlier that Samsung Group has taken a set of measures to improve its governance structure and transparency, and is expected to take further steps down the road. In March, a slew of large conglomerates, including Hyundai Motor Group, have unveiled plans to streamline its circular cross-shareholding structure through business spinoffs and mergers among affiliates, in the face of growing pressure from the antitrust agency to streamline their complicated ownership structure. (US$8.1 million) to impeached former President Park Geun-hye and her confidante, Choi Soon-sil, in return for government backing for the merger of two key Samsung units, a process that was deemed vital for his leadership succession. However, Lee was released from prison in February after being put behind bars for nearly a year on a suspended sentence. The FTC chief also stressed that his agency will continue to crack down on unfair business deals by founding family members of large conglomerates. South Korean fair trade law forbids inside deals aimed at giving unfair support to affiliates under the wing of a conglomerate. Family-run business groups have used such intra-company deals to help companies run by owner family members win lucrative contracts and earn huge sums of money. Under the proposed revision, inter-affiliate trading within a business group whose owner and family hold 20 percent or more of listed affiliates is forbidden, lower than the current 30 percent threshold. For unlisted subsidiaries, the limit is 20 percent. Such trading is blamed for allowing owner families to easily net large profits by having subsidiaries award lucrative contracts to each other, undermining the principle of fair competition. Also, the corporate regulator said earlier that the antitrust laws will restrict deals that favor companies owned by the founding family members of large businesses.